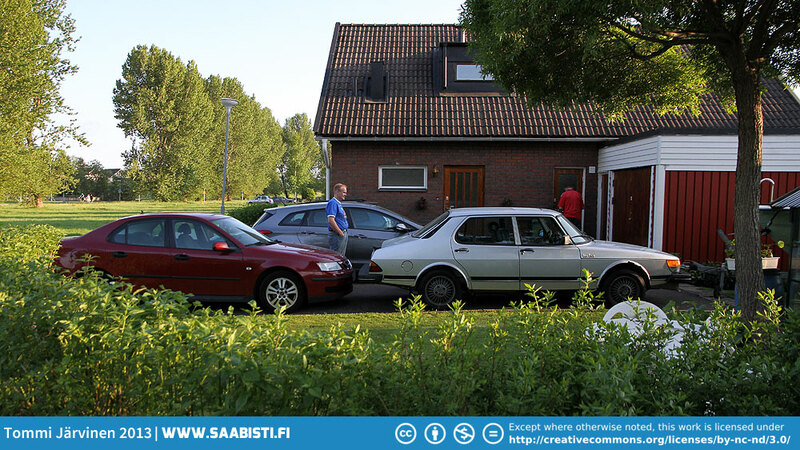 The trip to Trollhättan started on Wednesday from my garage at Nokia, Finland. 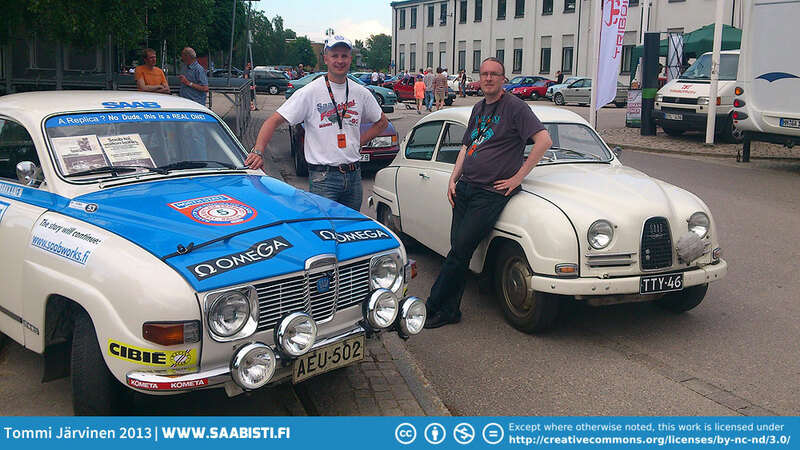 I drove my two stroke to Turku where I met Tikkis and Sami who brought the V4 Rally on a trailer. 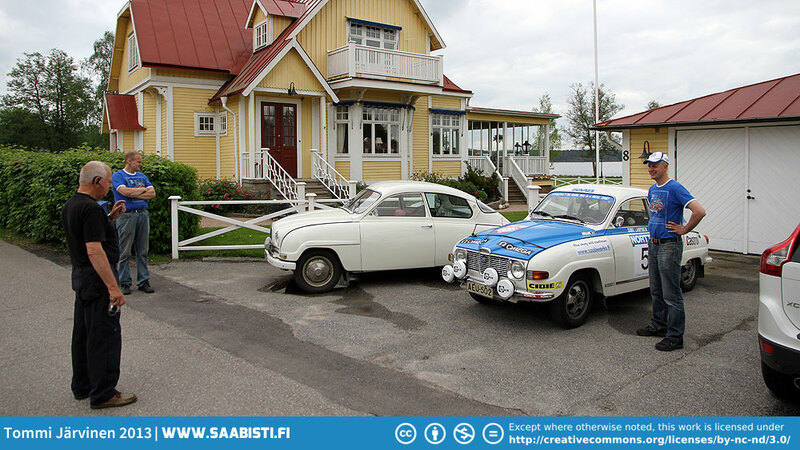 The V4 was offloaded (we left the trailer at a fellow saab club member Tero Setäläs shop) and we continued on to harbour and the ferry. 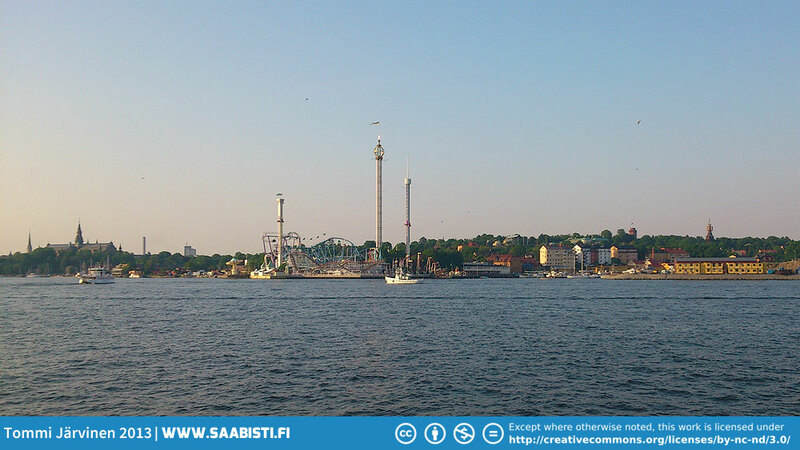 Thrusday morning we were at Stockholm and it was time for the drive to Trolhättan. 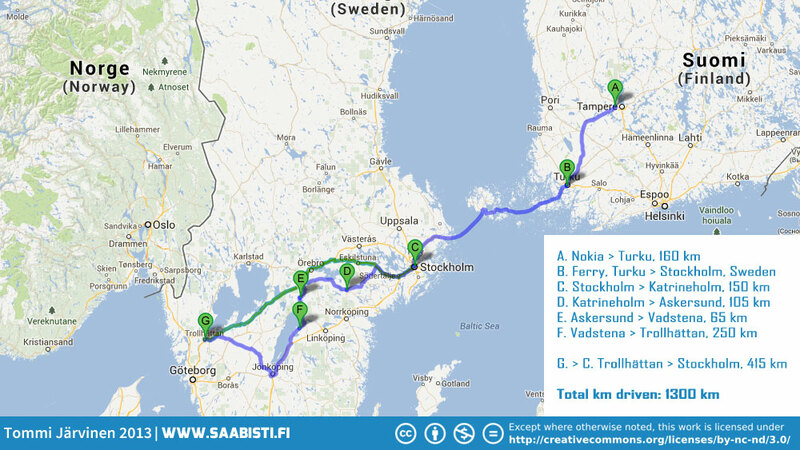 We took a bit longer route visiting some friends in Katrineholm, Askersund and Vadstena, and continuing on to Jönköping to drive around lake Vättern. 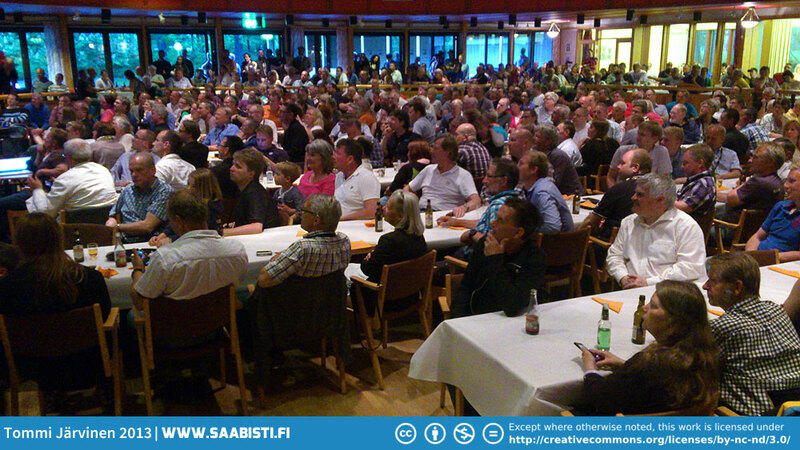 We were at Trollhättan on Thursday evening. 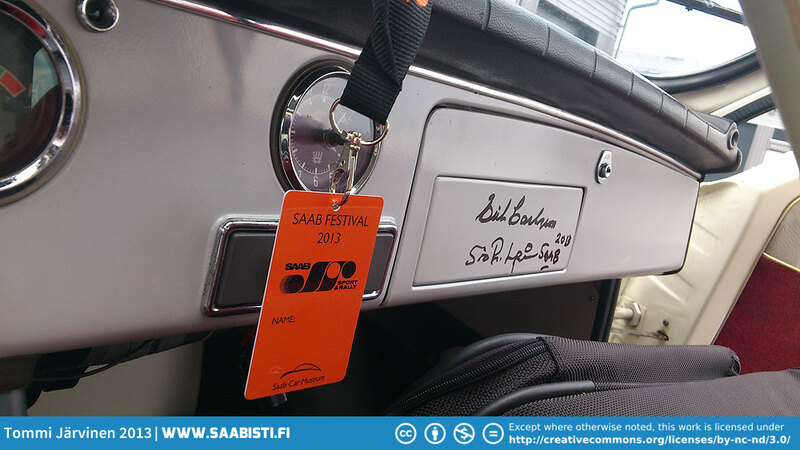 The event itself lasted three days from Friday to Sunday. 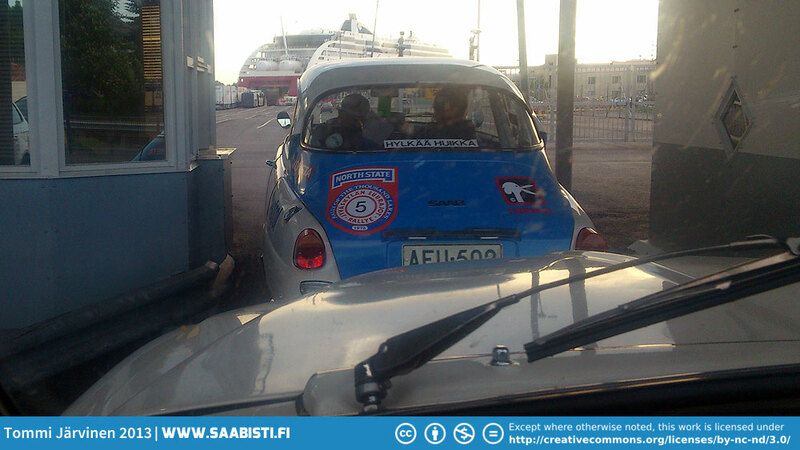 On Sunday we left at noon to drive back to Stockholm and continue on back to Finland. So – a few pics from the trip follow. 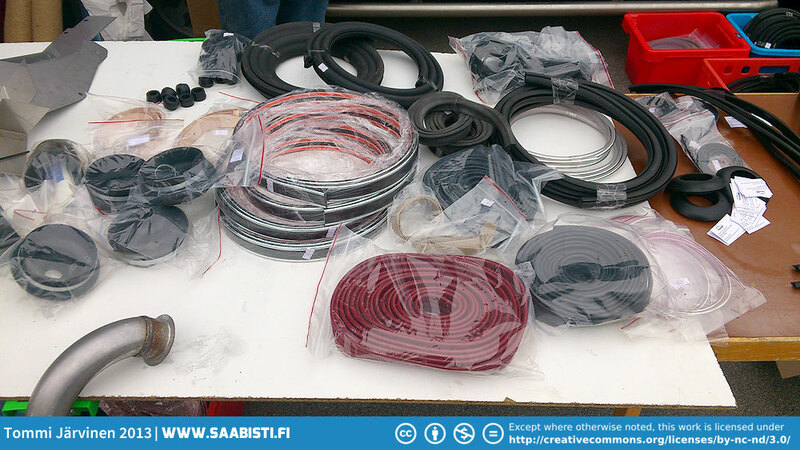 There are many photos of the event already online around the net so I think I’ll skip posting a generic photo gallery. 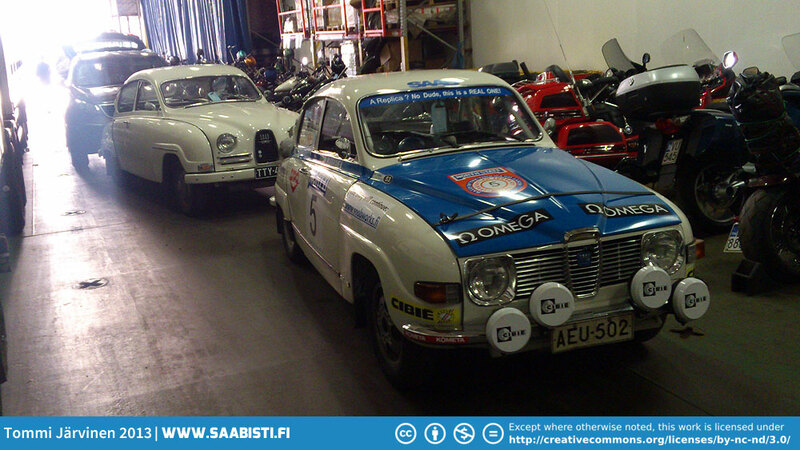 Instead I will post a few pics and stories of specific cars and other stuff later. 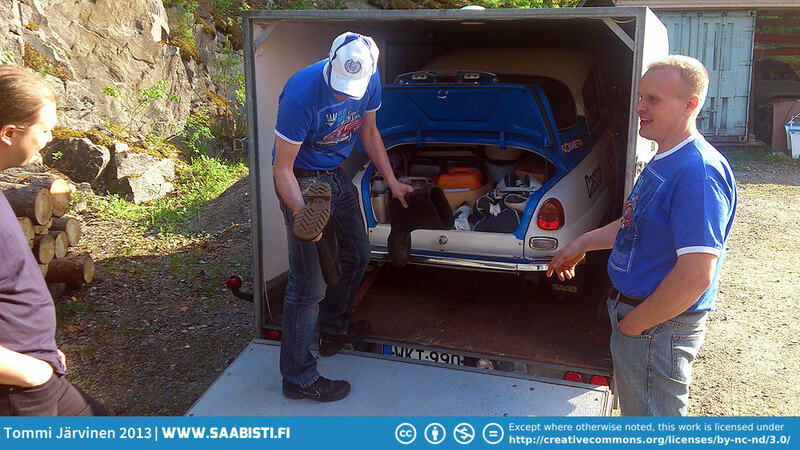 Taking the Saab 96 V4 Rally off the trailer in Turku, Finland. Going to the Ferry. Note the huge gas tanks on the back deck of the ship? Yep, it’s running on natural gas. 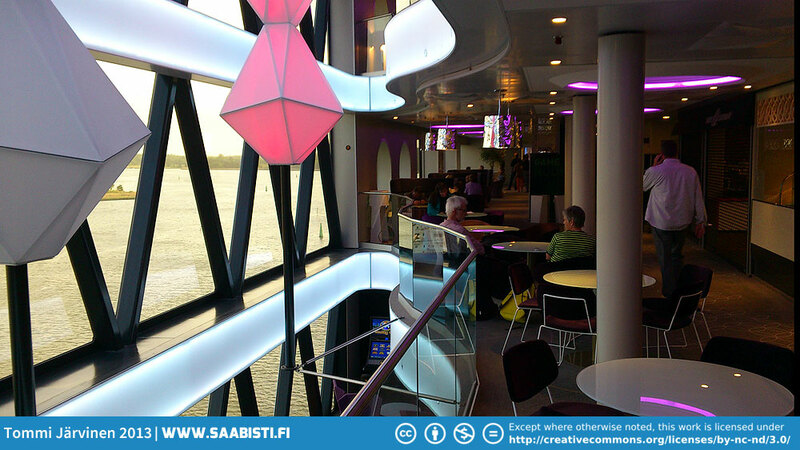 The Viking Grace is a pretty new ship – less than a year old. Kind of nice. 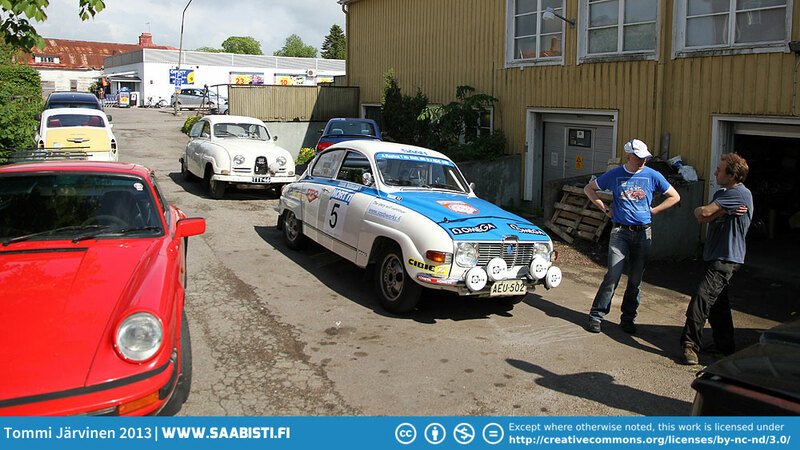 First stop in Sweden after Stockholm: Gunnar Fredriksson at Katrineholm. Gunnars garage. 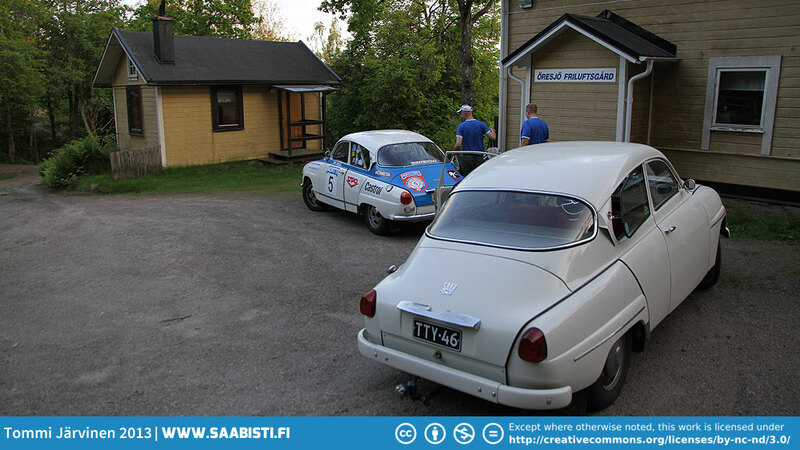 Checking out his Saab 96 V4 Rally which he actively races in the historic rally series. 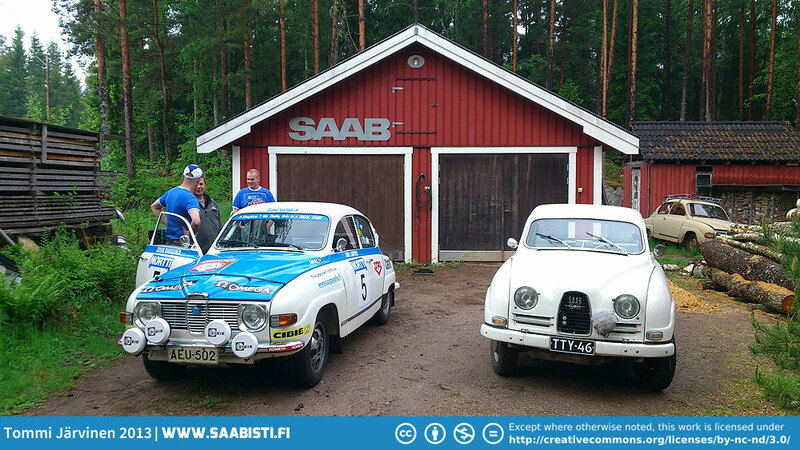 Rally Saabs in Finnish and Swedish colors. 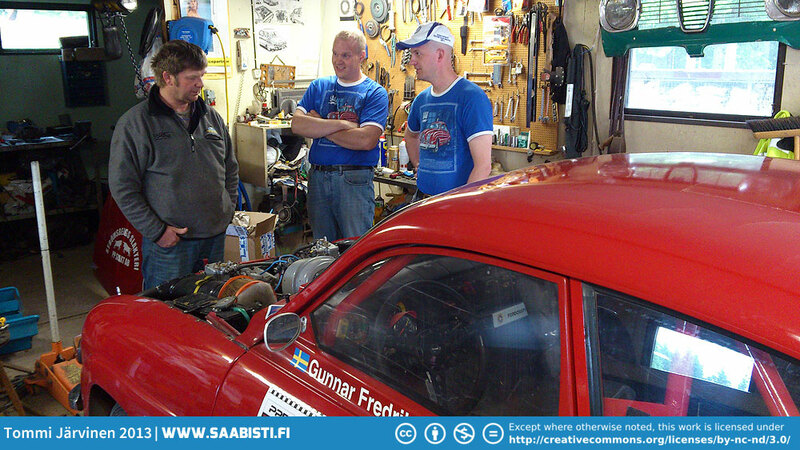 Next stop was Akersund where we visited Stig Carlsson of Peja Veterandelar (Classic car parts shop). 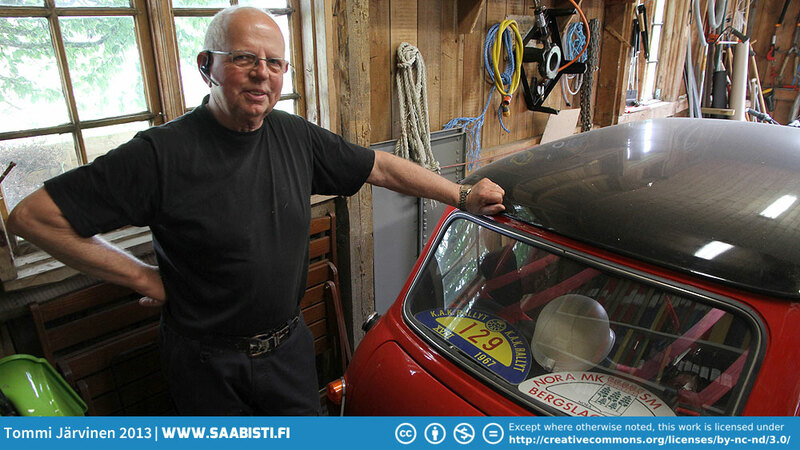 Stig used to race Minis in the sixties and still has a race ready Austin Cooper S.
On to Vadstena to visit Mattias Rosvalls garage. 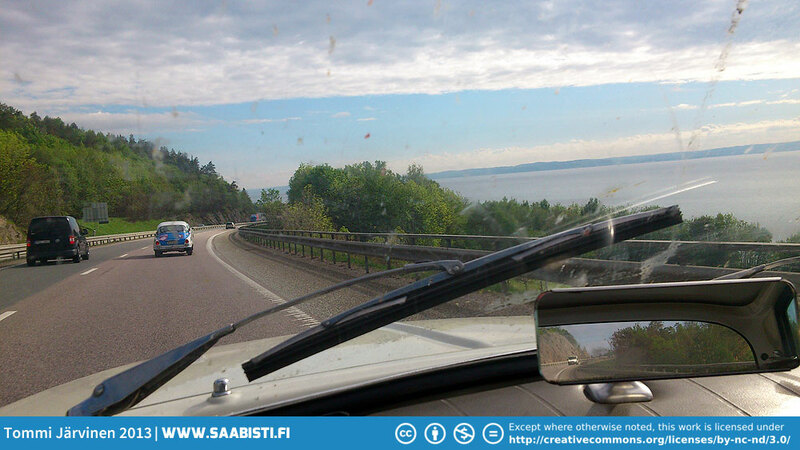 On the road to Trollhättan approaching Jönköping. 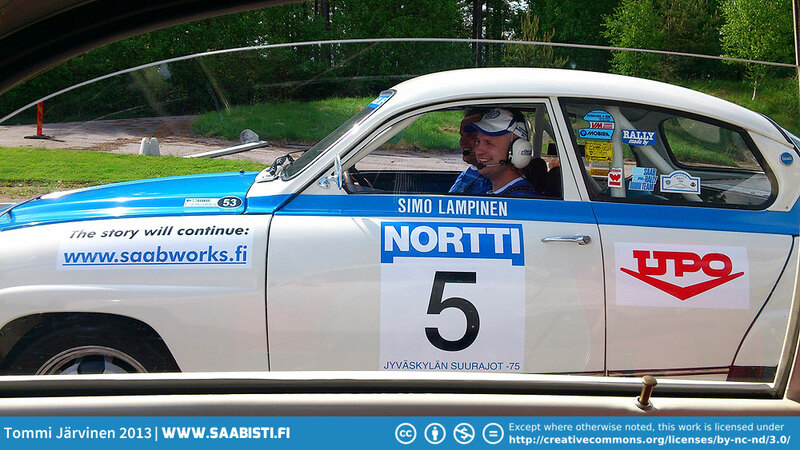 Tikkis and Sami in the blue and white. Arrival at Trollhättan. Getting the keys to our cottage. 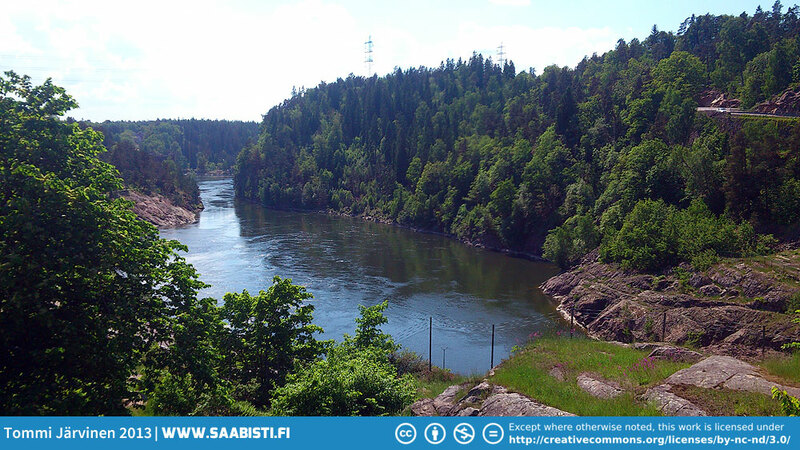 Trollhättan is a very beautiful town with some amazing sceneries. Thursday evening and our little cottage. Friday morning. 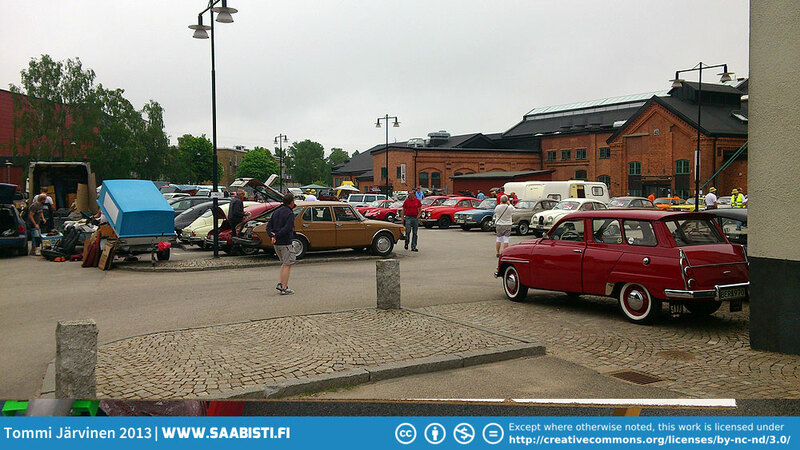 Some more Finns in Trollhättan. 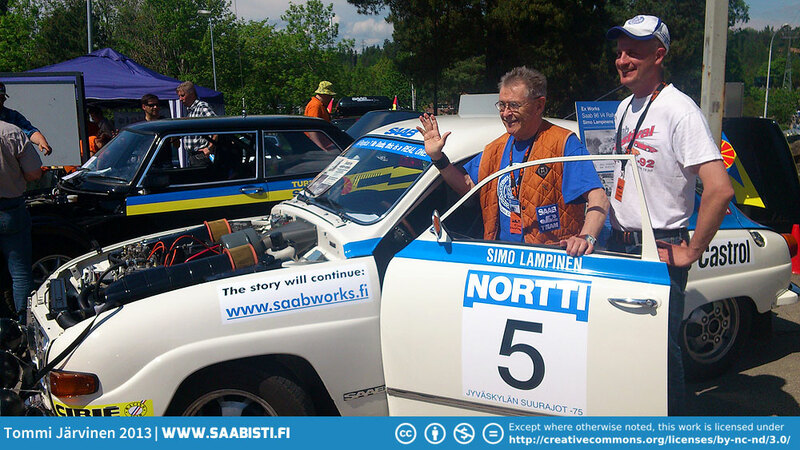 Simo Lampinen with his championship car of 1975. 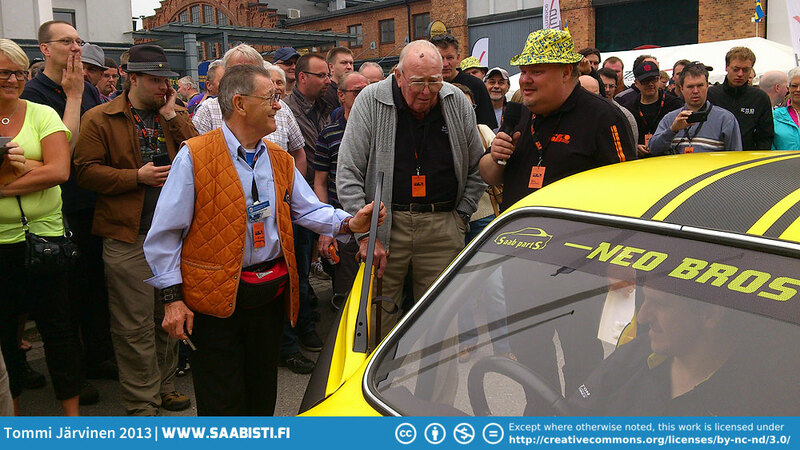 Current owner Tikkis on the right. There were some excellent presentations through the weekend. 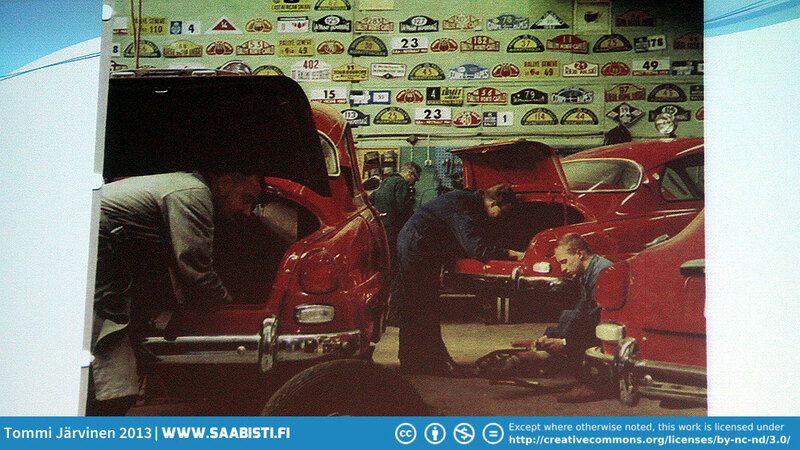 In the photo Saab competition department in 1963. 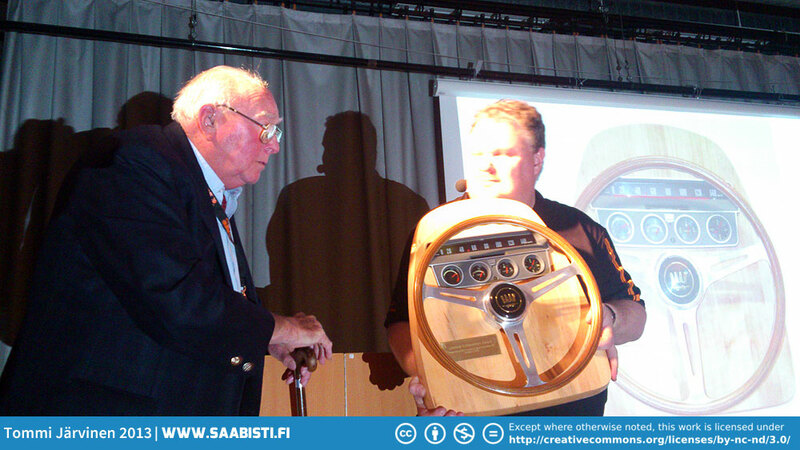 Erik Carlsson receiving his Lifetime Achievement Award from Peter Bäckström. 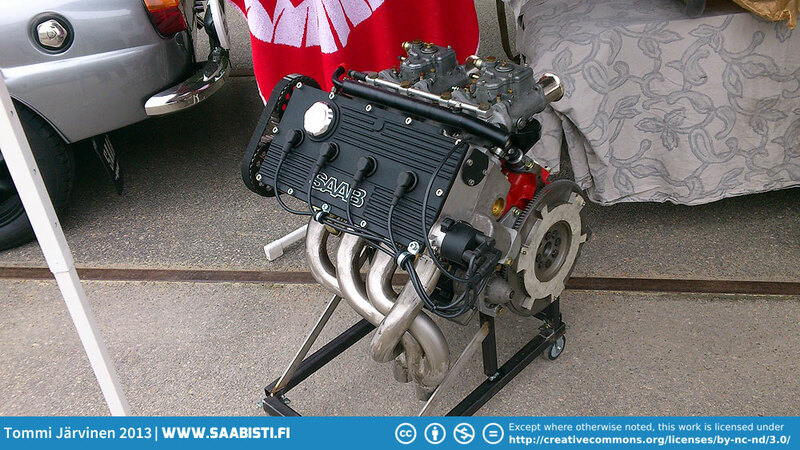 Originally he was supposed to receive this from Victor Müller already in 2010 but as Saab went under (again) it fell through. But better late than never. 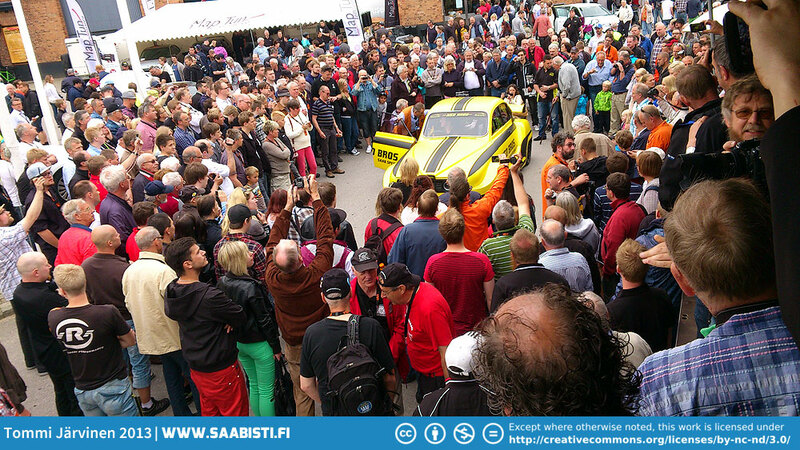 Neobrothers car reveal collected an audience. 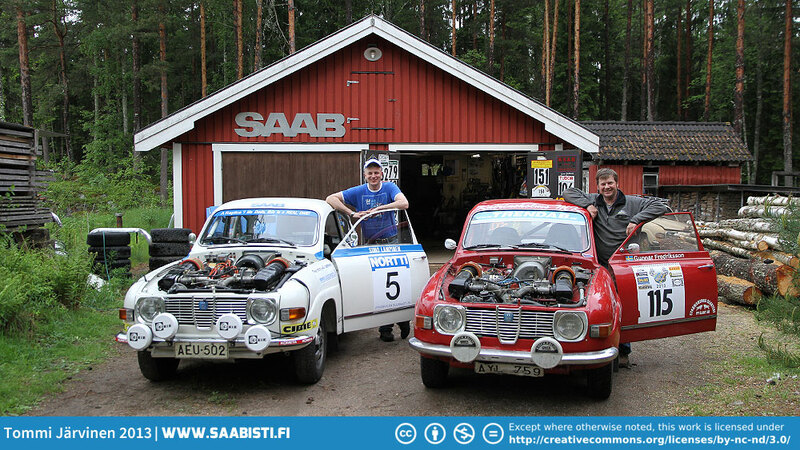 Simo Lampinen, Erik Carlsson and Peter Bäckström. 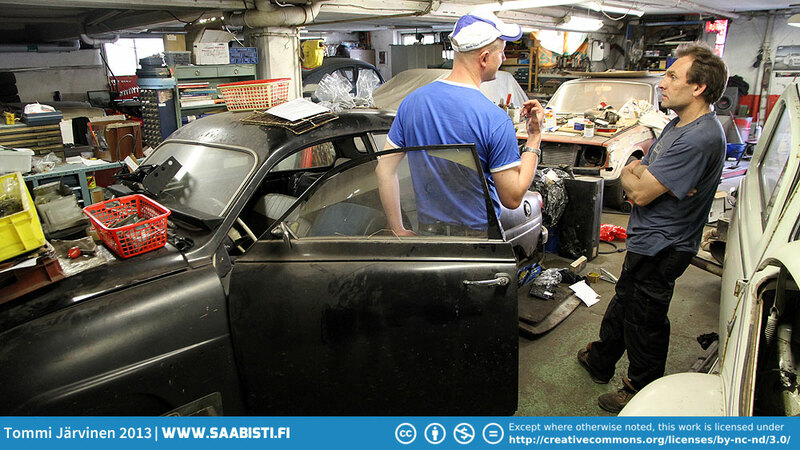 Saab 96 repro rubber parts. Pretty much all of this stuff was extremely hard to find a few years back. It’s very nice to see that they are being reproduced and available again. 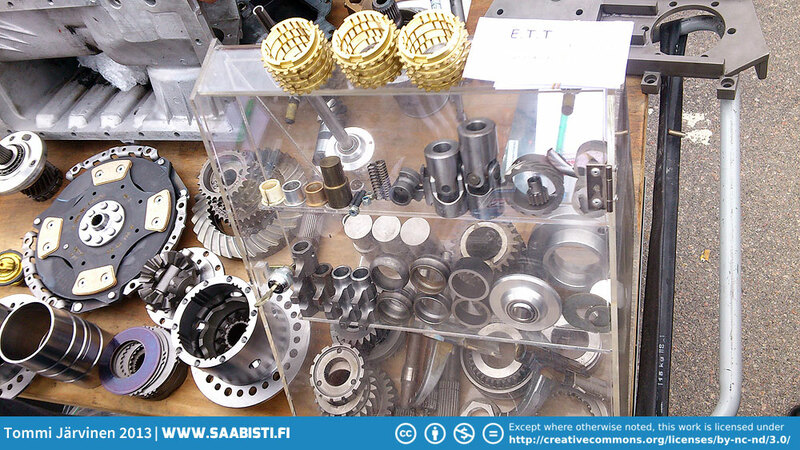 Saab 900 competition parts by Niko Gasparatos and Jörgen Eriksson. 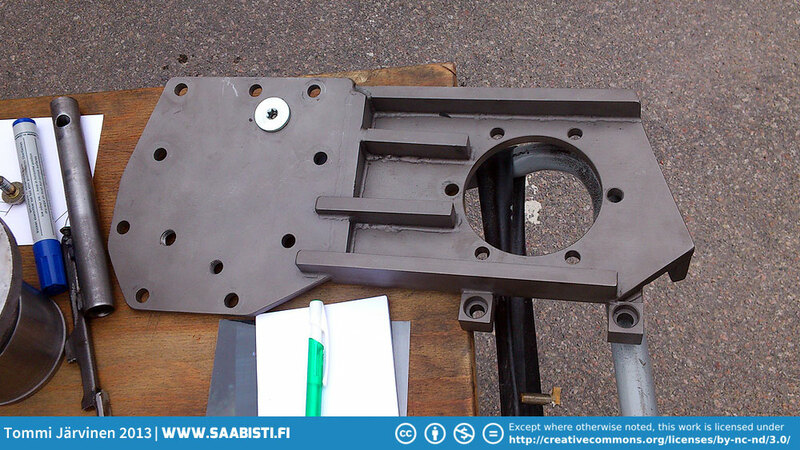 Saab 900 gearbox strengthening plate. 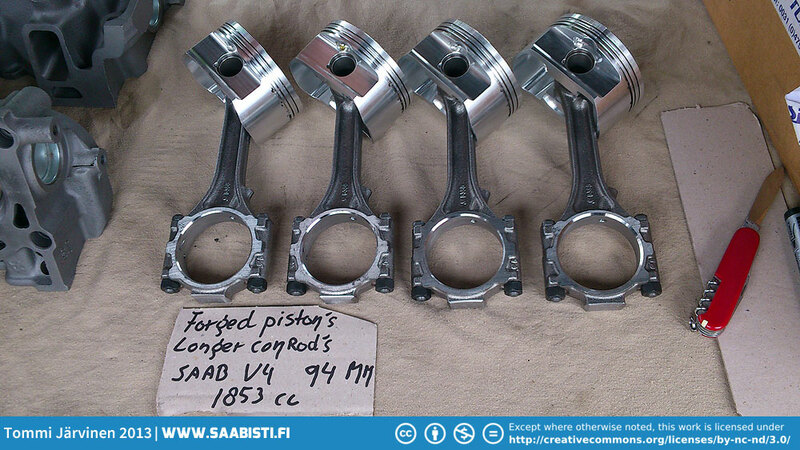 Saab 96 V4 forged pistons with longer connecting rods. 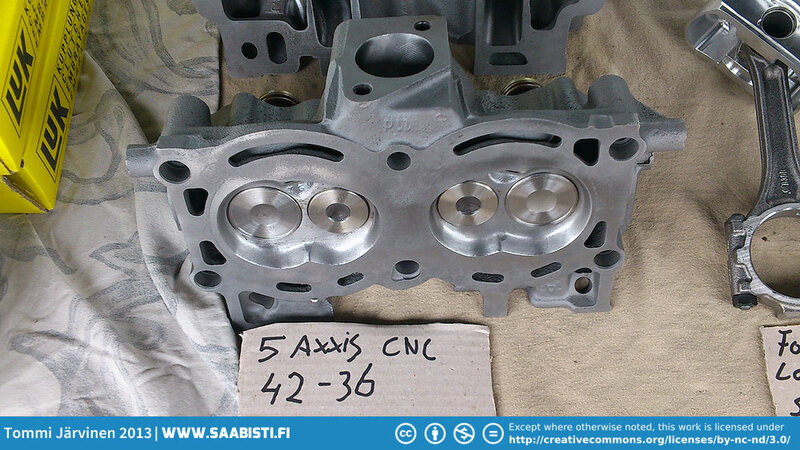 CNC milled head for V4 rally. 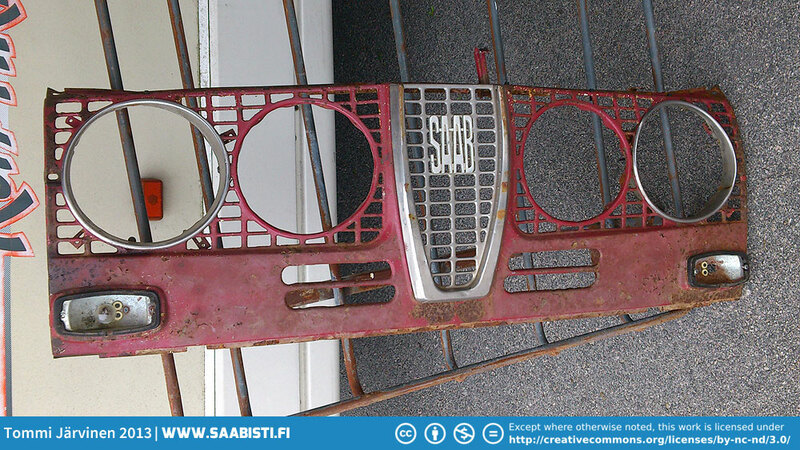 Extremely rare, original, longnose safari grille. Not for sale. Time to leave Trollhättan. 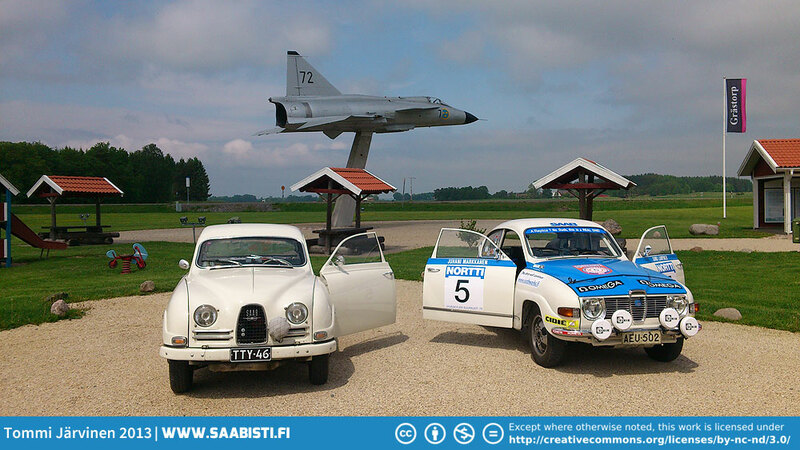 A little photo opportunity to remind us of the airplane heritage of Saab. Something to bring back home from the event. Signatures of Erik Carlsson and Simo Lampinen. 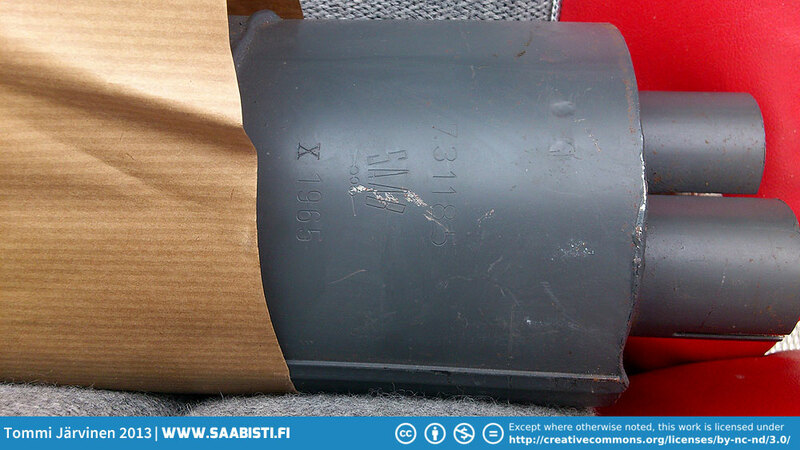 Bought an original Saab Sport rear muffler – made in 1965! A very lucky find! 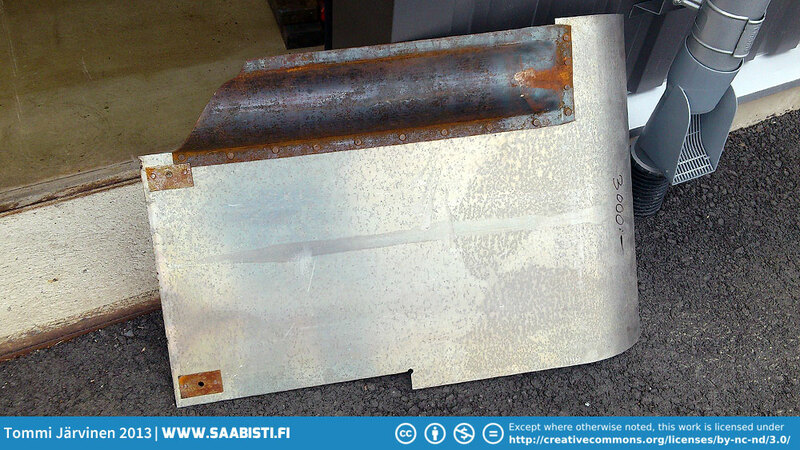 Factory original sixties two stroke sump guard. 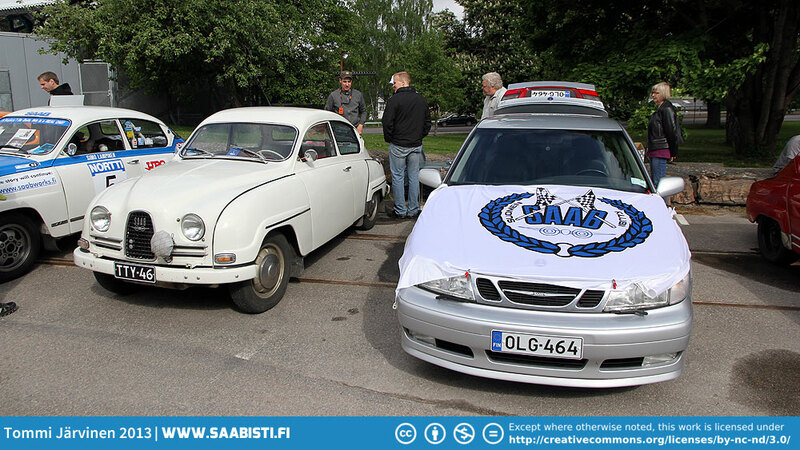 The are repros available but this is the real thing (as confirmed by Fredrik Ekendahl). I will ofcourse put it on the Sport. Unfortunately I could not be there, as I had other obligations, so it has just been great getting the report from your trip.